I'm trying to figure out to a problem with a planar manipulator. The manipulator has a base effector and L1 and L2 with 3 joints. Given the joints variables ($\theta_1$, $\theta_2$, $\theta_3$ and $\gamma$) I need to calculate the position(x, y, z) of the tool. In this case I don't know how to continue. From now, I will solely answer your second question about forward kinematics, which is usually easier to solve than inverse kinematics. 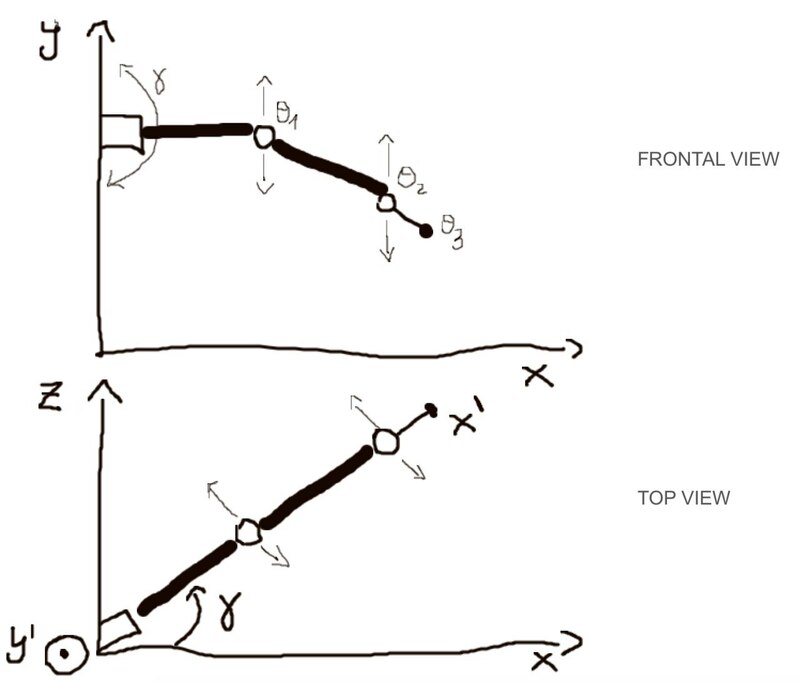 First you should sketch your robot in a plan using textbook representations for revolute and prismatic joints, this will make it clearer for you and the others. I needed to look at the picture to see that the 4 rotations are not along parallel axis. you fell less at ease and you use a systematic way, for example one of Denawit-Hartemberg parametrization. This option is well documented in any textbook or in DeLuca's slides, freely available online. This way is systematic, and less error-prone. Both methods boil down to the use of transformation matrices so are pretty efficient to implement nowadays. An hint about your inverse kinematics you have 4 degrees of freedom and want to find the inverse kinematic of a 3D position, there is potentially an infinite number of solution for such a problem. Not the answer you're looking for? Browse other questions tagged inverse-kinematics forward-kinematics manipulator rotation or ask your own question. Angular velocity vector expression uncertain?